The Carbon 14 dating method reveals a young earth! However, carbon 14 is unstable (radioactive) and will start to change back into Nitrogen. Carbon 14 has a half live of only 5,730 years. Therefore, given assumptions about how much carbon 14 was in something when it died, we can determine approximately how long the buried thing has been dead by the amount of carbon 14 still remaining in the sample. However, given the carbon 14 half-life of 5,730 years, no measurable amount would remain after even just several hundred thousand years at the most. This contradicts findings all over the earth. 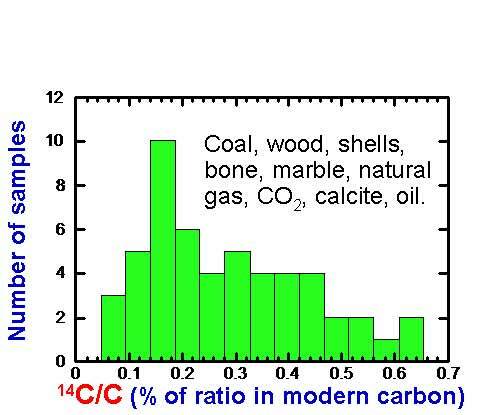 Carbon 14 can be detected in coal, wood, natural gas, fossils, and etc. found all over the earth throughout the fossil record. The above information poses a major contradiction to the evolutionary timescale. No measurable amount of carbon 14 should remain if these samples were truly millions of years old as the evolutionary timeframe would have us believe. The better explanation is the geologic column was the result of the global flood described in the Bible. Therefore, these samples are only roughly 4,500 years old, not millions. There has not been enough time for the carbon 14 to totally decay. Another proof from carbon 14 that the earth is young is as follows - the concentration of Carbon 14 to Carbon 12 has not reached equilibrium. Willard Libby new it would take about 30,000 years for the C14/C12 ratio to reach equilibrium within the earth’s atmosphere. He, being an evolutionist, was surprised to find that it had not yet been reached. Equilibrium should have occurred in the atmosphere within 30,000 years. Yet, the process is less than 1/3 the way there (see the figure below). Diamonds point to a young earth! Diamonds found deep within the fossil record have been carbon 14 dated and determined to have carbon 14 present. This is impossible to fit within evolutionary based assumptions. These diamonds are assumed to take millions of years to form and then would have been in the ground for many hundreds of millions of years given the strata they were found within. Yet the presence of carbon 14 shines serious doubt on these assumptions. The better explanation is that the geologic column was laid down during the flood and the diamonds were part of the original created rocks or developed since the flood. The science matches what the Biblical Creationist would expect. The Institute for Creation Research and Creation Research Society have been part of an 8 year project concerning radiometric dating methods and will be releasing their results on November 5, 2005 in San Diego (click here for conference details). This will provide much more detail for this most difficult subject of radiometric dating methods.